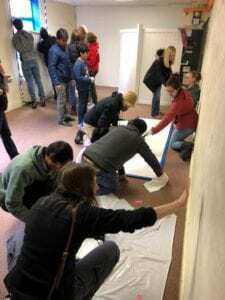 Volunteers paint over graffiti at the Shree Swaminarayan Temple & Cultural Center on Feb. 2. Hundreds of people, including several from Jewish Louisville, flocked to the Shree Swaminarayan (Hindu) Temple & Cultural Center in West Buechel Saturday to paint over symbols of hatred and show solidarity with yet another religious group under threat. The overwhelming turnout answered a teenager who broke into the temple on Sunday or Monday, spray painted slogans throughout the building, and left the a knife stabbed into a chair. The painted vandalism included crosses, defacement of a religious image and phrases such as “Jesus is the only Lord.” Police have arrested a 17-year-old boy for the crime. 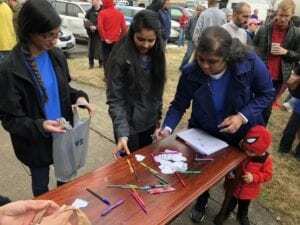 So inundated with support was the temple that its parking lot quickly filled up, so members directed cars to the Kosair parking lot next door – which also quickly filled up. A steady stream of people, most toting brushes, rollers, paint cans drop cloths and other items, filed into the building – a former church – climbed the steps to the sanctuary and balcony, removed their shoes and packed the worship spaces. They heard speeches by state and local officials, including Gov. Matt Bevin and Attorney General Andy Beshear, denouncing the hatred that fueled vandalism while extolling the show of love the incident elicited. State Rep. Nima Kulkarni (D-40, Frankfort) called Hinduism “a religion of peace, a religion of inclusivity and nonviolence” that inspired the Rev. Dr. Martin Luther King, Jr.
“Let us celebrate that spirit today as we erase these acts of vandalism from this place of worship,” she said. Louisville Metro Police Chief Steve Conrad lauded the outpouring of “love” at the temple, but he said it’s not enough. Visitors to the temple were asked to write messages on heart-shape slips of paper. Dr. Muhammad Baber, who represented the Muslim community, said he was also there on behalf of the Jewish Community of Louisville “who are observing Shabbat and are praying for all of us.” The crowd greeted those words with applause. Though preferring worshippers come to synagogue on Shabbat, Rabbi Beth Jacowitz Chottiner of Temple Shalom, quoting Rabbi Abraham Joshua Heschel, encouraged her congregants, in an email, to “pray with their feet” and go to the Hindu temple if they weren’t planning to be at services. Rabbi Emerita Gaylia Rooks of The Temple said The Temple rabbis reached out to a Hindu friend, Jonny Alse. This isn’t the first time a Louisville house of worship has been vandalized. Babar reminded the crowd of the 2015 desecration of the Louisville Islamic Center and the many people who came out then to paint over the graffiti. “I thought we had buried hatred and we had thrown it away in the Ohio River,” Babar said. Then a gunman shot to death two African-Americans on Oct. 24 at the Kroger in Jeffersontown. Shortly before then, the gunman, Gregory Bush, tried and failed to enter the predominantly black First Baptist Church of Jeffersontown. “It reminds us that our work is not done,” Babar said. So many people were present Saturday that many of them did not get a chance to pick up a paint brush. But Sunder Iyer, a member of the temple, said the expression of support was what mattered. “The good thing was everyone came,” he said. Notably, several Louisville Jews – and non-Jews – brought their children to the cleanup. Judith Danovitch said her son, David, got to paint a few brush strokes over the graffiti while her husband, Nick, unable to find a parking space, circled the temple in the car. D’var Torah: Don’t worry, be happy; it works!